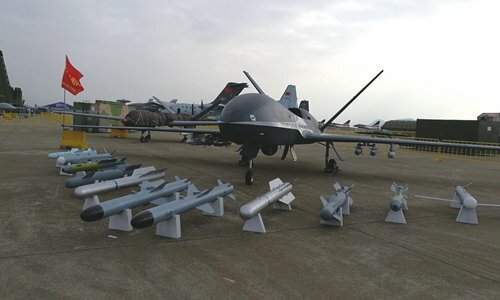 Unmanned aerial vehicles (UAVs) from different Chinese military industrial enterprises, including an unknown large stealth UAV, are getting ready to charm potential buyers around the globe at Airshow China 2018 which begins Tuesday in Zhuhai, South China's Guangdong Province. 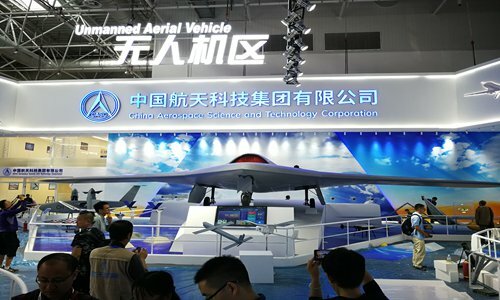 On Sunday, exhibitors were preparing to showcase their products in the exhibition hall, and a huge model of an unknown stealth UAV was set up in the venue of China Aerospace Science and Technology Corporation (CASTC). The UAV looks like the US-made stealth drone the X-47B, which has a wingspan of more than 20 meters. The X-47B is a demonstration unmanned combat air vehicle (UCAV) designed for aircraft carrier-based operations, which was developed by the US defense technology company Northrop Grumman. China Academy of Aerospace Aerodynamics (CAAA), the producer of the unnamed UAV, told the Global Times that the official information on the UAV will be released Monday. Song Zhongping, a military expert and TV commentator, told the Global Times that the new drone could be the CH-7, China's most advanced UAV. "It has similar capabilities as X-47B, which is stealth and is used for both reconnaissance and attack missions." The UAV will not only serve in the People's Liberation Army (PLA) Air Force, but is also for sale to China's overseas clients, Song noted. "This means China is getting increasingly close to US capability in terms of design and production of UAVs. But US drones can operate globally, China's drone are currently only able to conduct missions in specific regions until China's BeiDou satellite system realizes global coverage," Song said. 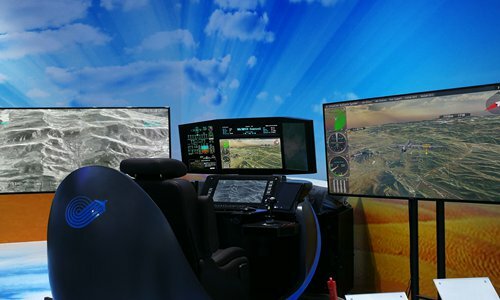 The CAAA also announced that it has already realized a combat system which can allow one control station to control two different types of UAVs at the same time. Lan Wenbo, chief engineer of CH-5 UAV, told the Global Times on Sunday that CAAA successfully developed the technology at the request of overseas clients. "Currently, there is no precedent around the globe that could allow one control station to control two or more large-scale reconnaissance and attack UAVs. This will reduce the cost to our clients and improve the cooperative combat capability of our UAVs," Lan said. For example, the commander can simultaneously order a smaller and cheaper UAV to lure a hostile anti-aircraft system to expose itself and launch an attack, while another combat UAV can launch missiles to destroy the anti-aircraft system, Lan noted. The "Cloud Shadow" UAV independently developed by Aviation Industry Corporation of China (AVIC) will also make its appearance at the air show. This UAV has a cruising altitude higher than the range of most surface-to-air missiles and are much faster than first generation UAVs. "In a battle of medium intensity, Cloud Shadow can safely conduct fast and extensive intelligence gathering and long-distance precise attacks against targets on the ground and sea," AVIC said in a statement sent to the Global Times on Sunday. While satisfying the domestic market, Cloud Shadow is also vigorously exploring the international market and is receiving continuous attention from overseas buyers, the statement read.